Big player. 12.2-inch screen, octa-core, touchscreen with stylus support - Samsung's Note Pro 12.2 catches attention when just hearing the specs. We looked at the Wi-Fi version and will reveal whether the expectations are met. 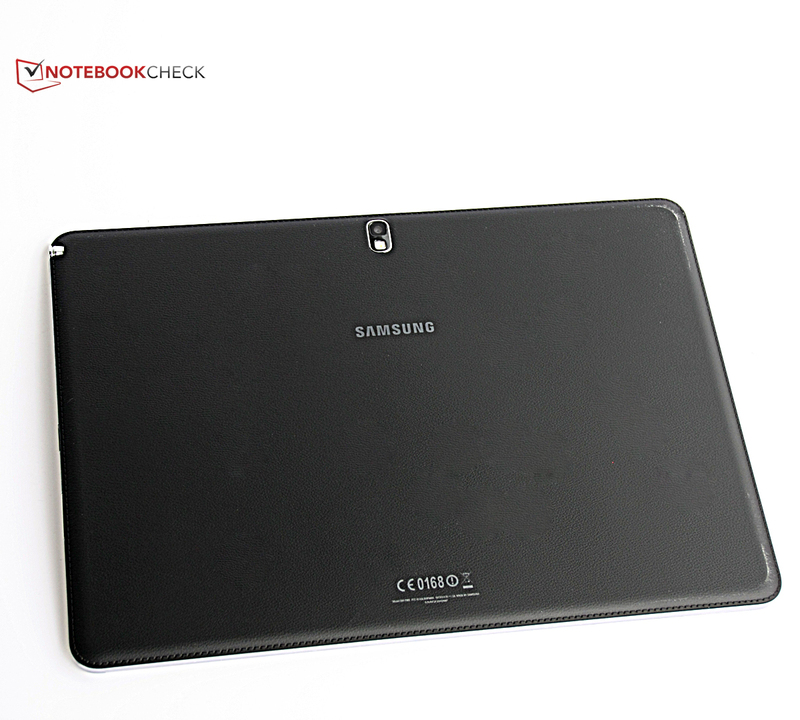 In review: Samsung Galaxy Note Pro 12.2. Review sample courtesy of Cyberport. In times past, we watched Hollywood movies, America's Most Wanted, and the news on a 31-centimeter screen - at least most second TVs weren't much bigger. Today, 12.2-inches in shape of a tablet can be conveniently held in a hand, and clips from old TV shows are watched via YouTube. 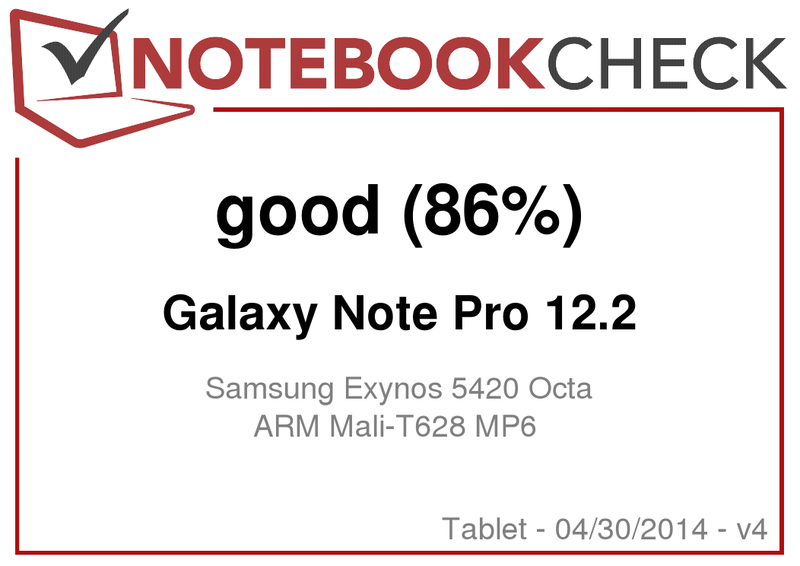 Samsung's Galaxy Note Pro 12.2 is just such a tablet, and it is clearly aimed at professionals who use their tablet on the job with a price of over 700 Euros (~$973), stylus support, and multitasking suitability. The slim outline, large screen, and high-quality looks also make it attractive for private users with the necessary cash at first glance. We are testing the model without mobile Internet but will provide an update about the tablet's LTE version within the next few days. The Galaxy Note Pro 12.2 does not have to compete against other, equally-sized devices because there are not yet many options. The contenders, such as Apple's iPad Air, Sony's Xperia Tablet Z or Microsoft's Surface Pro 2, are all smaller. In terms of performance, the Galaxy Note Pro 12.2 can be compared with the strongest tablets like Toshiba's Excite Pro or Gigaset's QV830 with Nvidia's Tegra 4 SoC. 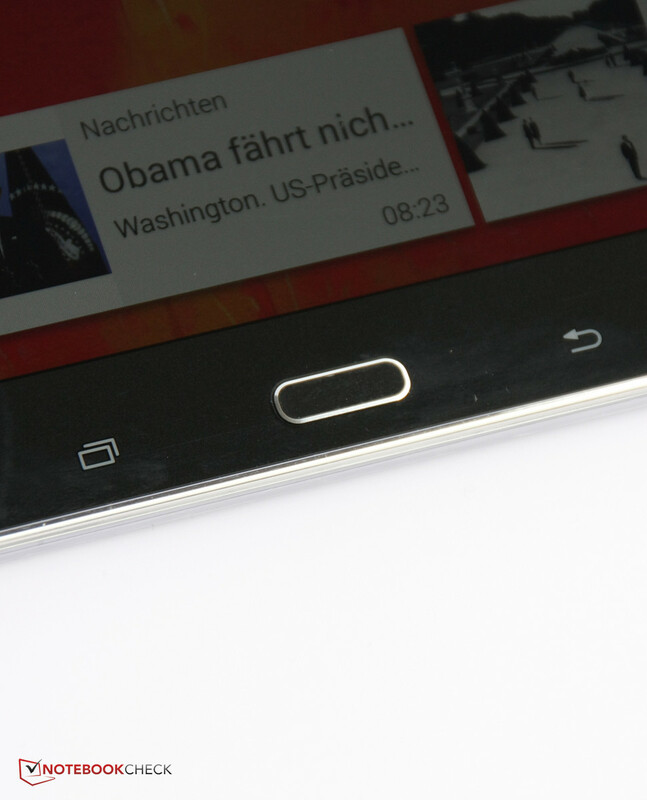 The Snapdragon 800 in the Galaxy Note 10.1 might also be a worthy rival for the octa-core in our review sample. The back of the rigid casing is completely covered with faux leather. We know from other Galaxy models that we should not expect a metal exterior. Samsung relies on polycarbonate, which is plastic with a quite premium feel. The chrome-colored rim, rounded edges, and slim silhouette are almost a traditional design component of the Galaxy line. 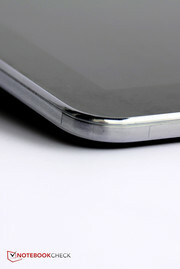 With 7.95 millimeters, the tablet is thicker than the iPad Air or Sony's Xperia Tablet Z, but it still looks very slim. The choice of materials and the pattern used on the back of most Galaxy models are always good for a surprise, and the Galaxy Note Pro 12.2 is no exception. Faux-leather, even with seams indicated at the edges, cover the back side. This conveys a high-quality feel, is non-slip, and certainly fits in an elegant office environment. The casing's rigidness is good, but the tablet warps easily, and medium pressure on the back center becomes visible on the screen. 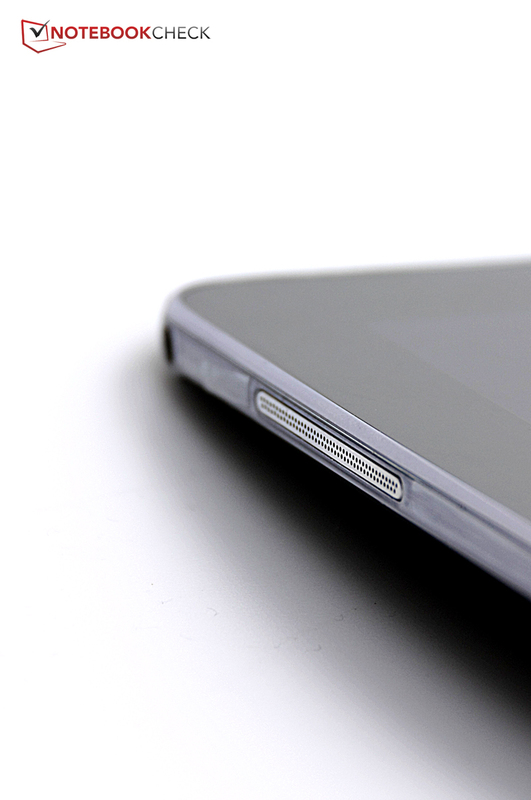 Most tablets have a micro-USB port for recharging or connecting the tablet with other devices. Samsung wants more: A micro-USB 3.0 port integrated in a 2 x 5 pin mini-B socket is on the right. Thus, both standard-sized micro-USB cords and bigger 2 x 5 pin plugs with a higher power output for faster tablet recharging can be used. Not quite as favorable: The tablet apparently had problems connecting to the PC. It was detected as an error by Windows 7 in our test, and accessing contents was not possible. Beyond that, it is possible to connect compatible monitors directly to the USB 3.0 port via the MHL standard, or to optionally buy an HDMI adapter. There is also an infrared sensor for controlling TV sets on the upper edge. 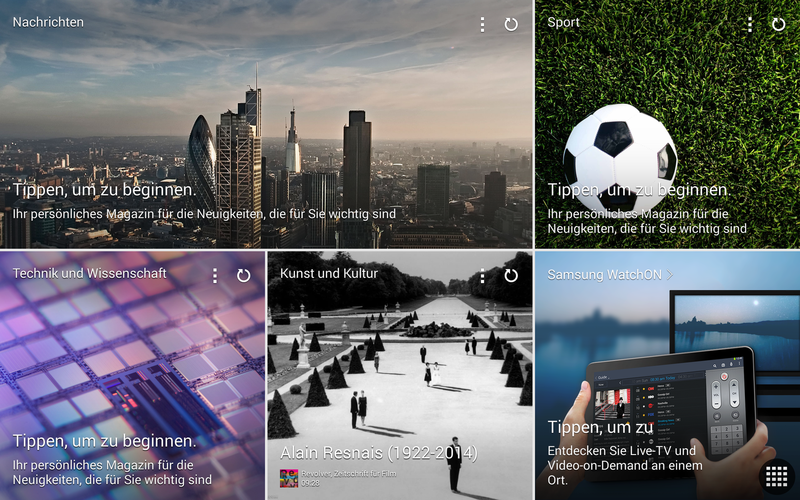 The interface's design using large pictures is stylish and clearly arranged. Samsung's TouchWiz interface is based on the latest version of Google's Android 4.4 KitKat operating system. Consequently, it is very similar in use although Samsung relies on large-scale images, and thus creates a very high-quality surface that can always be used intuitively. 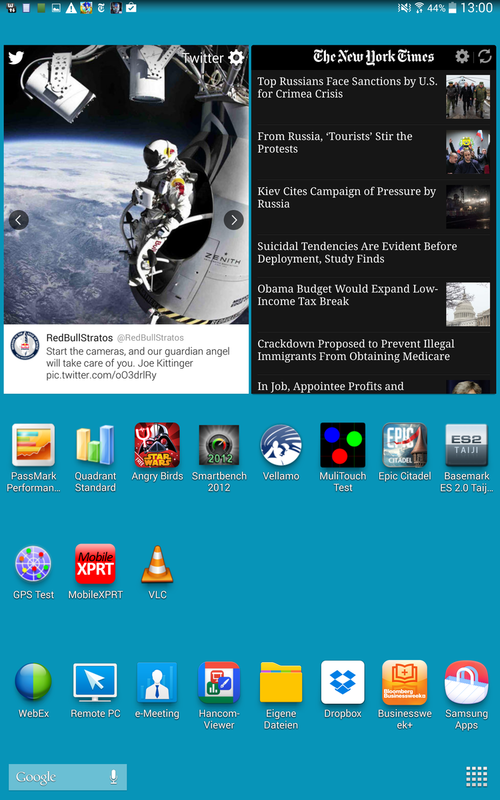 The Content Home interface at the very left of the main menu can be completely filled with widgets so to, for example, organize a personal "magazine" comprised of Internet news, or read social media updates. Many of the pre-loaded applications are optimized for the included S Pen digitizer pen. S Note is part of the device's name, and offers many extensive possibilities for creating notes, drawings, and much more using the stylus. Users who want to deal more profoundly with the art of digital painting and sketching will find an even more effective app in Autodesk SketchBook. 50 GB of online storage in Dropbox is just as available via the installed app as the video conferences using WebEx. Remote PC enables accessing and controlling the home PC when on-the-go. 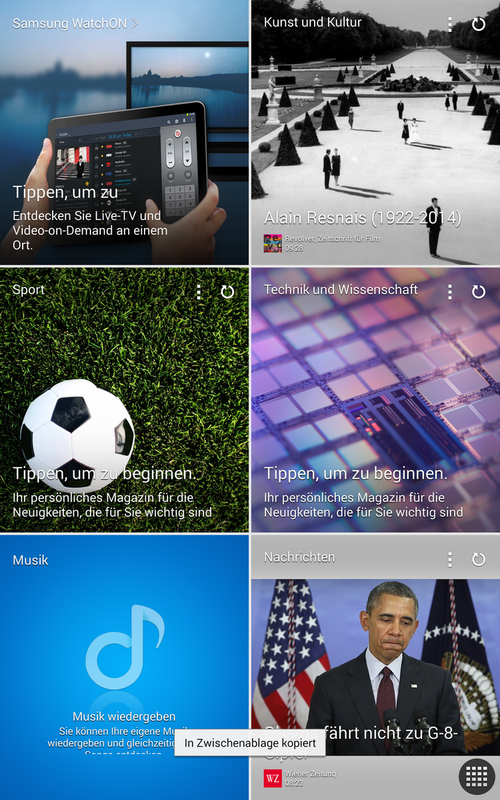 However, an additional Samsung account is required for some apps, which also allows using Samsung's own app store. The Wi-Fi module transmits using the 802.11 a/b/g/n/ac standards, which is state-of-the-art, and as fast as up to 500 Mbit/s. The module supports both the 2.4 GHz and 5 GHz frequency bands. The module's transmission and reception performance were very good. The full signal reached our tablet at a distance of ten meters, and through three walls. 75% of the signal was still available when three more meters and a brick wall separated us from the device. The GPS module's reception strength that supports the Russian Glonass system also impressed us. The system found enough satellites to locate us within a very short time even indoors. The accuracy was, however, not always convincing. 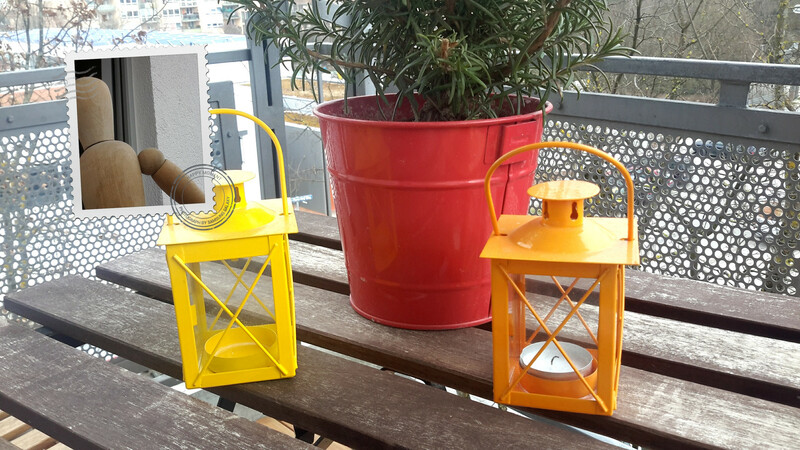 The position deviated by up to 20 meters indoors, and up to 10 meters outdoors in cloudy conditions. 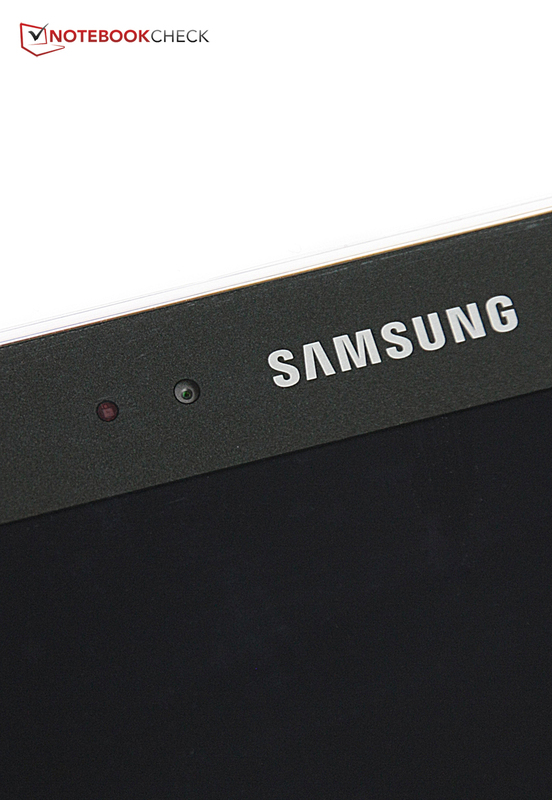 Samsung treats the Galaxy Note Pro 12.2 to two cameras. The rear-facing model has a resolution of 8 megapixels (3264x2448 pixels), features auto-focus, and an LED flash. The front-facing unit is more intended for video calls or rudimentary selfies for social networks, and therefore it only has a resolution of 2 megapixels (1920x1080 pixels). While the pictures of the rear-facing camera look a bit unsaturated and blurred, the ones from the front-facing camera are too dark. However, the focus is good in both cases. 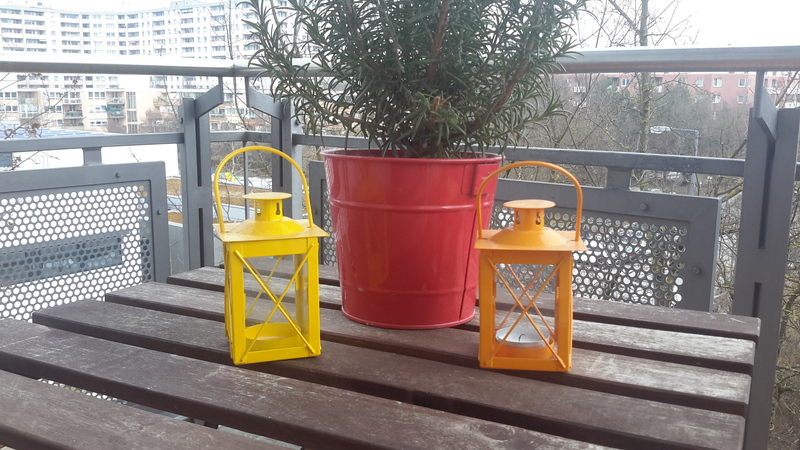 Overall, the pictures are quite usable, and the camera app pleases with numerous effects and settings. It would only be logical to see whether the tablet can cope with high-definition videos in view of the screen's very high resolution. We downloaded a 4K test video from the Internet for this purpose. The result: Uncompressed 4K video files are much too difficult even for the octa-core processor, as expected. However, the tablet cannot play H.264 compressed files either. It is surely the S Pen that especially sticks out of the mass of included accessories. It might be a bit too short for large hands, but it is very stable, and it works very reliably with the accurate touchscreen. A LAN adapter that can be connected via the micro-USB 3.0 port is optionally available. It is also possible to connect a mouse or keyboard via an additional full-size USB port. Samsung demands 59 Euros (~$82) for this. A cover with built-in stand is available for the same price. Samsung includes a 24-month warranty on its tablet. The warranty is valid throughout the EU, providing the device was purchased in the EU. The 12.2-inch, capacitive touchscreen naturally offers a huge surface, and a very high resolution. Consequently, letters are well-legible, and the icons are large and easy to hit. 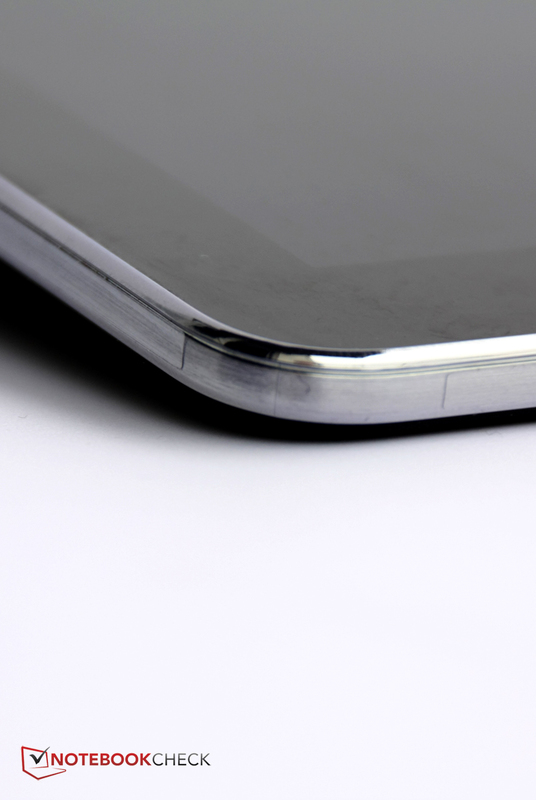 As known from Samsung's TouchWiz, there are tiles that can be dragged from the side or the top. This, of course, only works reliably when the touchscreen is sensitive enough at its edges. 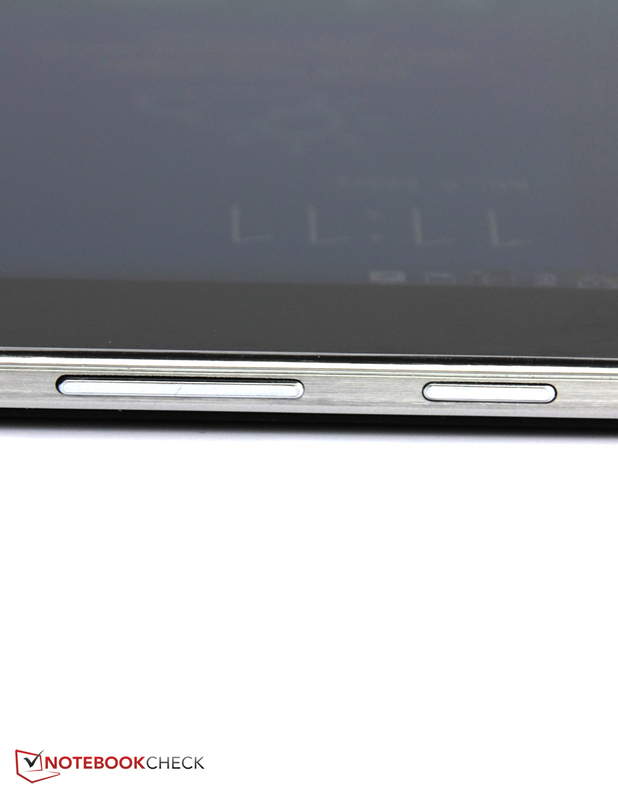 This is the case in the Galaxy Note Pro 12.2, and it is possible to place reliably responding controls even in the corners. The touchscreen supports up to 10 fingers, and Samsung's gesture control is installed again. 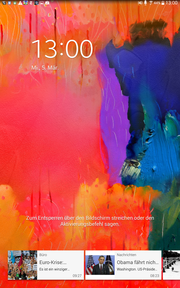 Screenshots are made by swiping over the screen with the edge of a hand. The audio is turned off when the screen is covered with the hand or when the tablet is turned over. 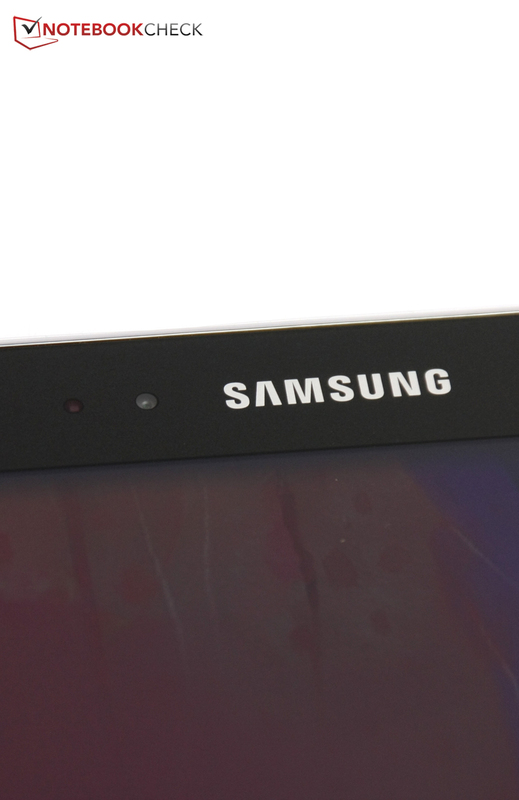 Like in former Galaxy models, the front-facing webcam can be set to recognize the eyes, and stops videos when the user does not look at the screen, or it scrolls automatically. That only functions moderately well. 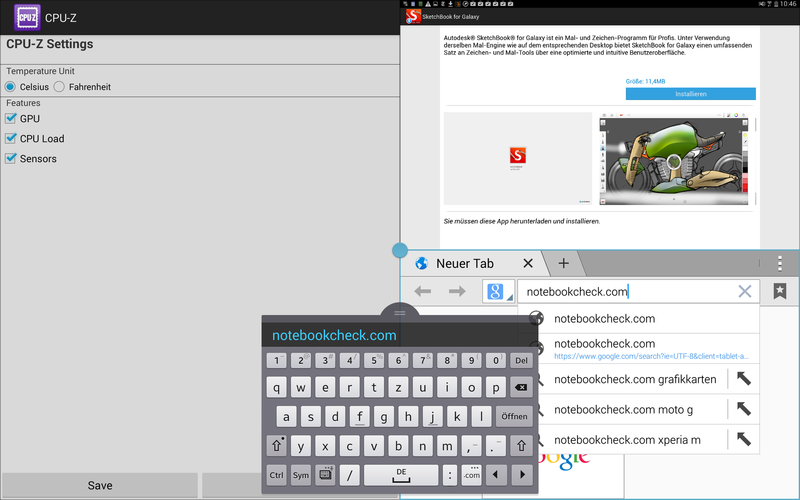 This feature might really become useful for users who occupy themselves intensively with this feature. 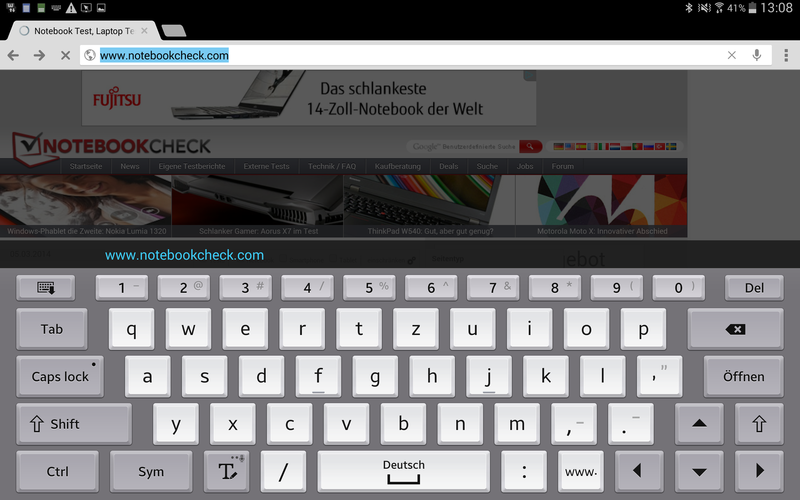 The virtual keyboard also benefits from the screen's size. Because the keys are so big, both hands can be used for typing in portrait mode. 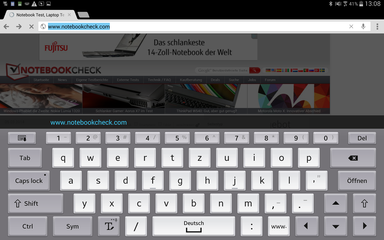 Touch-typing is only possible in landscape mode, but that is not a matter of course either. The input options are just as numerous as the settings. Starting with handwriting detection over dictation, up to swiping over the keyboard without lifting a finger - all popular input modes are available. 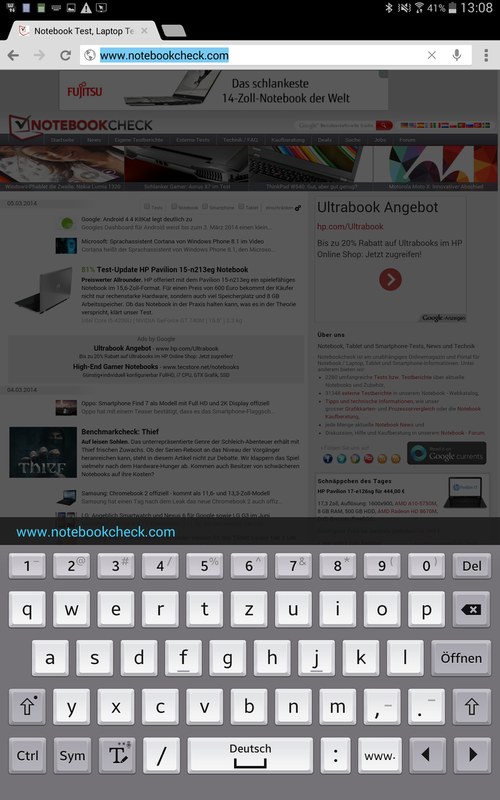 Users can add a period by tapping twice on the space bar, or allow a space to be inserted automatically when a word has been identified. This all works very reliably, and users will definitely find their favorite mode among the many input modes. 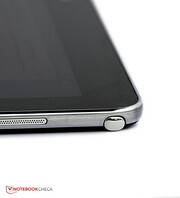 The digitizer dubbed "S Pen" by Samsung is inserted into a small compartment in the tablet and is easy to pull out. 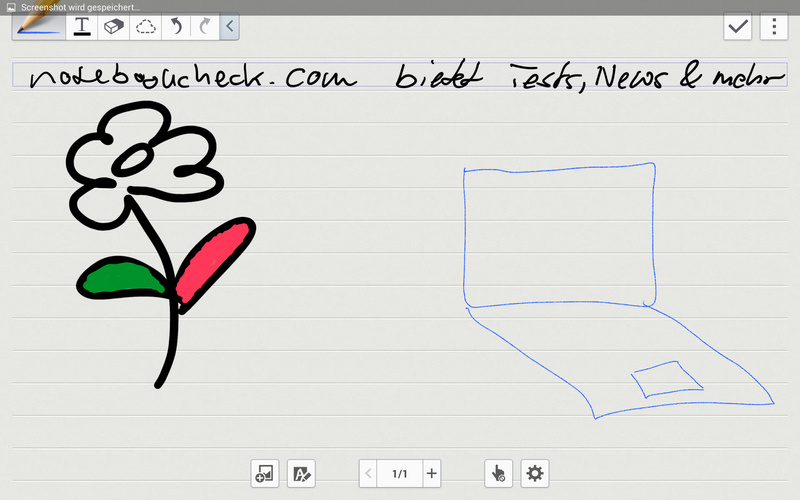 It enables even more accurate use in many fields, and it is of course perfect for drawing and sketching on the tablet. The tablet also detects the pen when it hovers one millimeter above the screen, and can open a ring menu via the stylus' button, which contains the most frequently used applications for the pen (notepad, screenshot with note, sketchpad, search, and its own window). Samsung does not rely on a screen based on AMOLED or PLS technology for its Note Pro 12.2, but on a so-called Super Clear TFT LCD. 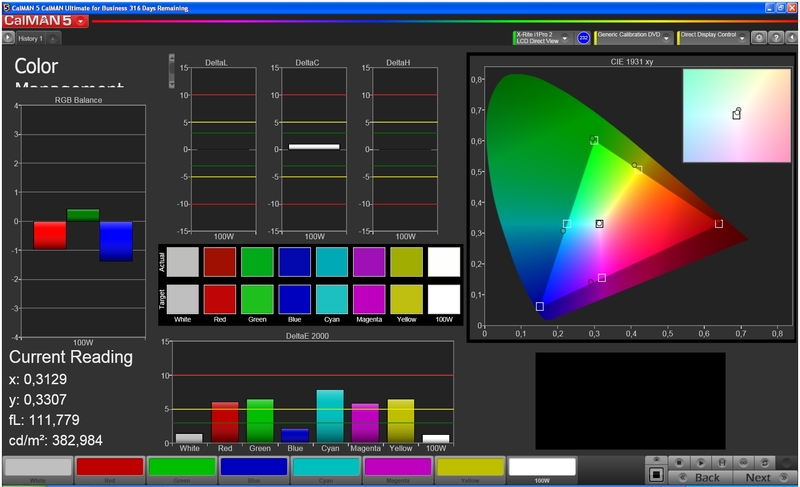 It has a resolution of 2560x1600 pixels, which corresponds to the WQXGA standard. Samsung has selected a good brightness for the screen. Its average is second place in the comparison field - only the iPad Air is brighter. The illumination of 83% is not quite as homogeneous as in most contenders though. 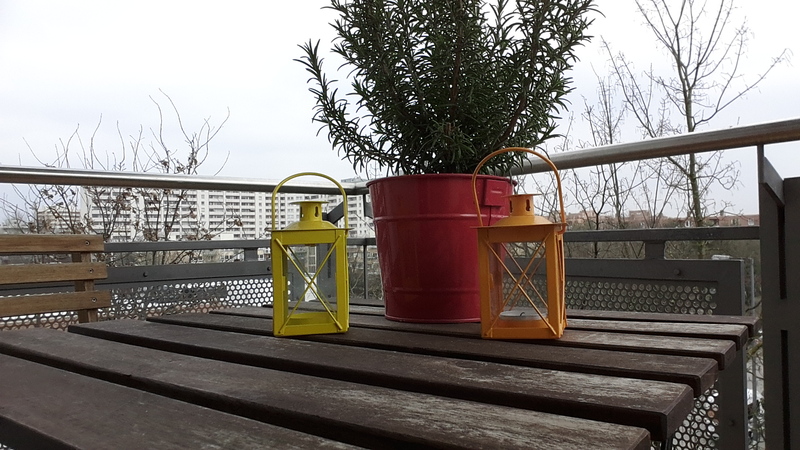 But brightness differences are hardly seen with the naked eye. 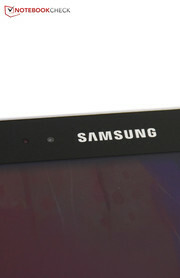 In contrast to AMOLED, the black level of the LCD screen is innately higher. However, contenders like the iPad Air or Microsoft's Surface 2 have a clear advantage. The 0.73 cd/m² of brightness that radiates from our review sample is quite high and lets black look more like dark gray on the screen. That also unfortunately reduces the contrast to 537:1, which is also a rather poor rate in the comparison field. It also has an impact in practice: Colors look much richer and the image generally look more vivid on other Samsung devices. 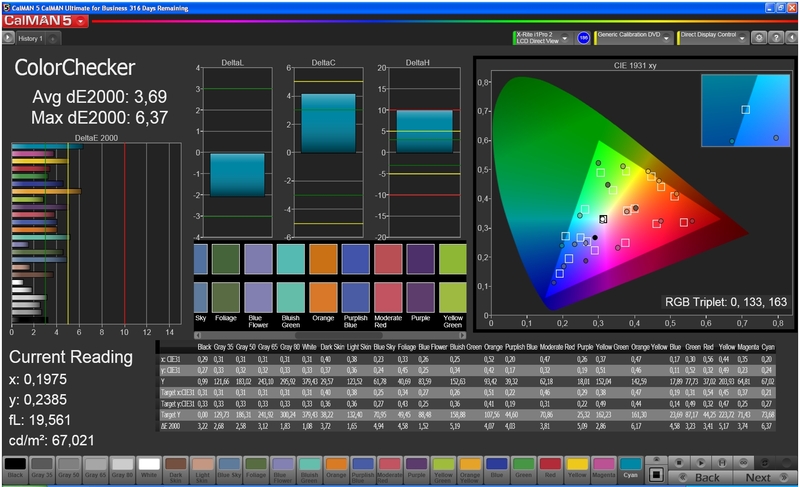 The different color modes have been adopted from other Galaxy devices, and are dubbed "Dynamic," "Video," and "Standard." It is also possible to set the Video mode to automatic. 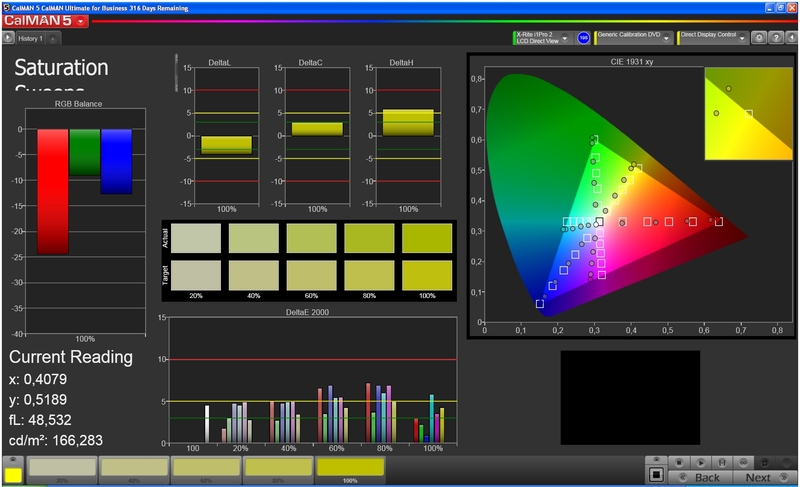 The Video mode displays the palest, but also the most natural colors. Standard is between the two, and Dynamic enhances both the saturation and contrast. 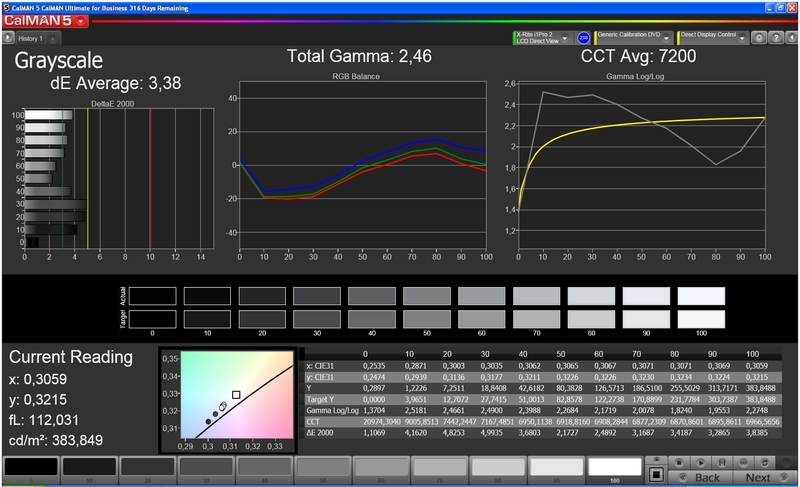 That was our subjective impression, and we measured it using the colorimeter and CalMAN software for a more accurate analysis. The results confirmed our observations. The DeltaE shift from the color space reference rate was lowest in Video mode in both colors and grayscale. Nevertheless, the screen is generally relatively color accurate; none of the colors shifted into the red field. In view of the partly quite high color shift compared with the more exacting AdobeRGB color space, professionals who work a lot with image and video material will have to use another monitor. The relatively high brightness can hardly prevent reflections from overlapping content on sunny days due to the reflective screen. 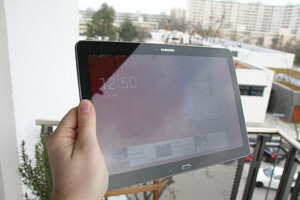 However, the Galaxy Note Pro 12.2 can be used well on cloudy days, in the shade, and in bright rooms. The viewing angles are absolutely satisfactory from top to bottom and from the sides. The TFT LCD screen is in no way inferior to an AMOLED screen. A special feature of Samsung's Galaxy Note Pro 12.2 is its SoC: The Samsung Exynos 5420 Octa is the first genuine eight-core SoC of its category, although not all cores clock at the same rate and only run simultaneously under maximum load. The four Cortex A15 cores with a clock rate of 1.8 GHz are supplemented by four Cortex A7 cores that clock with 1.3 GHz, and which are used when little power is needed. That saves energy. This difference is occasionally quite evident in routine use. Since the four weaker cores take over in the main menu, navigating is not always smooth due to the high resolution. However, everything runs smoothly as soon as a game or a more demanding app is loaded, even in the screen's full resolution. 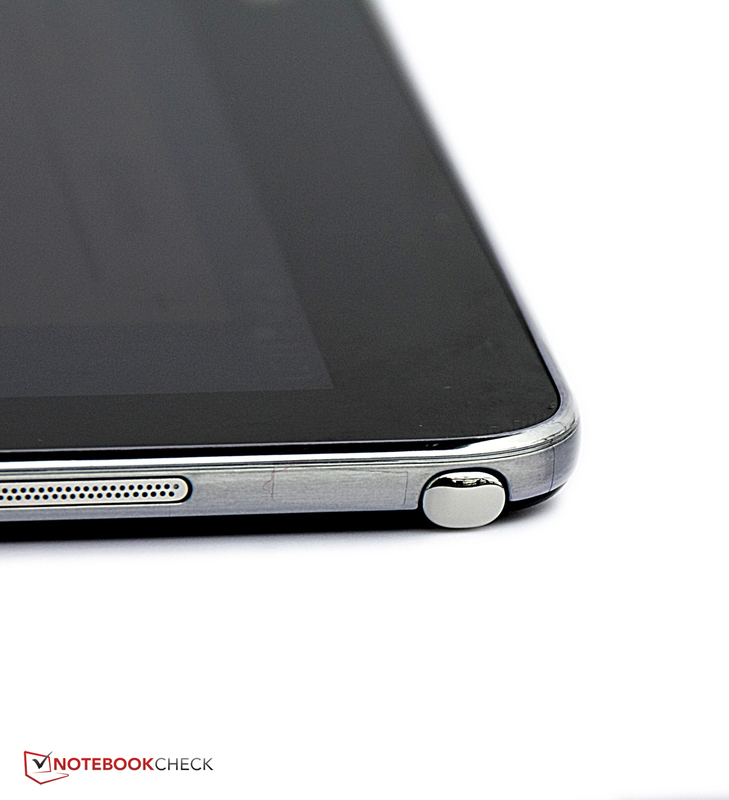 The SoC in our review sample is remote from the performance of the Apple A7 in the iPad Air. However, it is on par or even a bit before the Galaxy Note 10.1, whose Snapdragon 800 MSM8974 SoC clocks considerably higher with 2.26 GHz, in most system and CPU tests. Toshiba's Excite Pro and its Tegra 4 SoC can also still keep up here. Both the iPad Air and Galaxy Note 10.1 have the lead in the 3D benchmarks, and Toshiba's Excite Pro lags behind. The Mali-T628 that takes care of graphics calculations works with the maximum possible resolution here. That shows just how fast this graphics solution is. It should be sufficient for all current apps in any event. Even fast-paced 3D games like Iron Man 3 are no problem. As mentioned, the Mali T-628 is one of the swiftest mobile graphics solutions. Consequently, even fast-paced and demanding games from Google's Play Store are no problem for the chip. 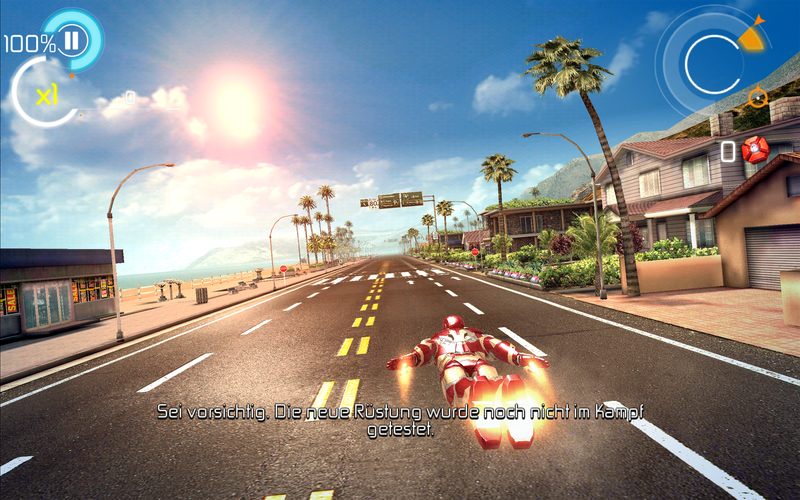 Imposing 3D games like Iron Man 3 are also rendered very fast in the screen's full resolution. The loading times are also short. 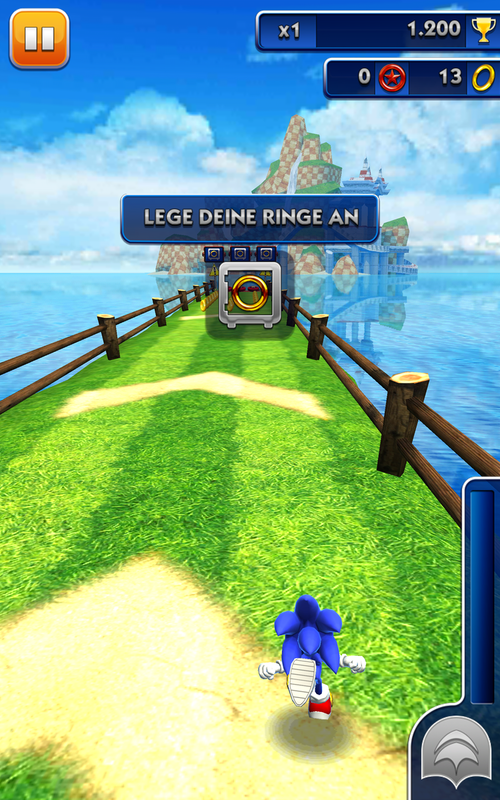 Obviously, titles like Angry Birds: Star Wars 2 run just as smoothly, and load quickly. It is pleasing that the casing of Samsung's Galaxy Note 12.2 barely heats up significantly despite its octa-core and higher performance. Only a very slight temperature increase to 32.2 °C is noticed in idle mode, owing to the four lower-clocked processor cores. This is restricted to the lower front side (in landscape mode). Almost no temperature increase is felt on the entire back. The temperature climbs up to 38.8 °C on the upper front, and the back also gets a bit warmer during load. However, this temperature is still very acceptable, and in no way unpleasant. (+) The average temperature for the upper side under maximal load is 30 °C / 86 F, compared to the average of 30.7 °C / 87 F for the devices in the class Tablet. (+) The maximum temperature on the upper side is 38.8 °C / 102 F, compared to the average of 34.8 °C / 95 F, ranging from 22.2 to 51.8 °C for the class Tablet. (+) In idle usage, the average temperature for the upper side is 28 °C / 82 F, compared to the device average of 30.7 °C / 87 F.
The speakers' position on the upper side edges make it quite unlikely that they might be covered, and thus weaken the sound. Just like the positioning, we also liked the speakers' sound that does not distort even at maximum volume and provides a powerful and balanced audio experience. Although there is barely any bass, the sound is sufficient for watching an occasional Internet video or listening to the radio now and again. Perhaps it is due to the big screen, but the contenders, in particular Apple's iPad Air and even Samsung's own Galaxy Note 10.1, do a much better job with saving energy. This already starts in standby where the Galaxy Note Pro 12.2 drains as much as 1.3 watts from the battery. The iPad Air only consumes 0.2 watts. When the screen is turned on, but the tablet is still idle, the power consumption climbs to 2.9 watts, which is roughly one-and-a-half times as much as the iPad Air or Galaxy Note 10.1 use. Then again, the load power consumption is on a similar level, but Samsung could have made cutbacks somewhere else. This does not give much hope for battery runtime, although the battery in the Galaxy Note Pro 12.2 is sufficiently designed with 35 watt hours. However, the runtimes are not that bad after all. The Galaxy Note Pro 12.2 lasted for almost 9 hours in the realistic Wi-Fi test, which is a fairly practical rate, and roughly on par with Apple's iPad Air. However, the device should not be left running in idle mode because it is drained after only 10:23 hours, without having done much. The high standby consumption also leads to a discharged battery within approximately one-and-a-half days when the tablet is not used at all, and is left in standby. However, Samsung's Galaxy Note Pro 12.2 is generally quite useful for on-the-go, but the charger should not be left at home. 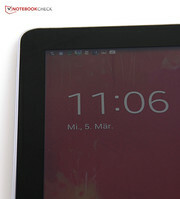 Buyers can expect quite a lot in a tablet for over 700 Euros (~$973). For example, good connectivity, easy use, and extensive software or sensible, optional accessories. Samsung is beyond reproach in these points, and even adds an accessory bundle with a value of just under 180 Euros (~$250) for the so-called "Launch Edition." 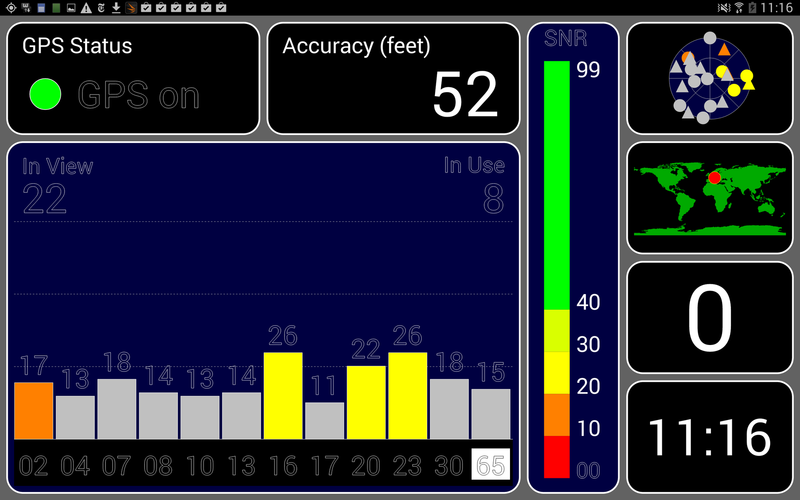 Besides that, the Wi-Fi module is state-of-the-art, the GPS module functions reasonably, the infrared sensor is handy. Samsung's TouchWiz interface convinces with a multitude of options, and a very classy surface in terms of software. 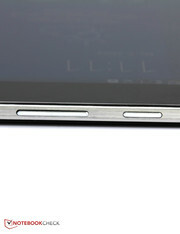 Its functionality makes using the virtual keyboard's extensive settings, and the digitizer pen, pleasant experiences. The screen that is not quite as brilliant as in some other devices from Samsung and the too high power consumption are minor points of complaint. However, this can probably be ignored when feasible battery runtimes are achieved, the temperatures remain low, and both the application and gaming performance are first-rate. The main menu's choppy use that is the result of the lower clocked processor cores, which are responsible for low load, are more severe in such an expensive device. All in all, Samsung launches a very big tablet on the market with the Galaxy Note Pro 12.2 that still can be held comfortably in one hand and features high-quality looks that convince at first glance. Hardly a flaw is found even when looking closer. 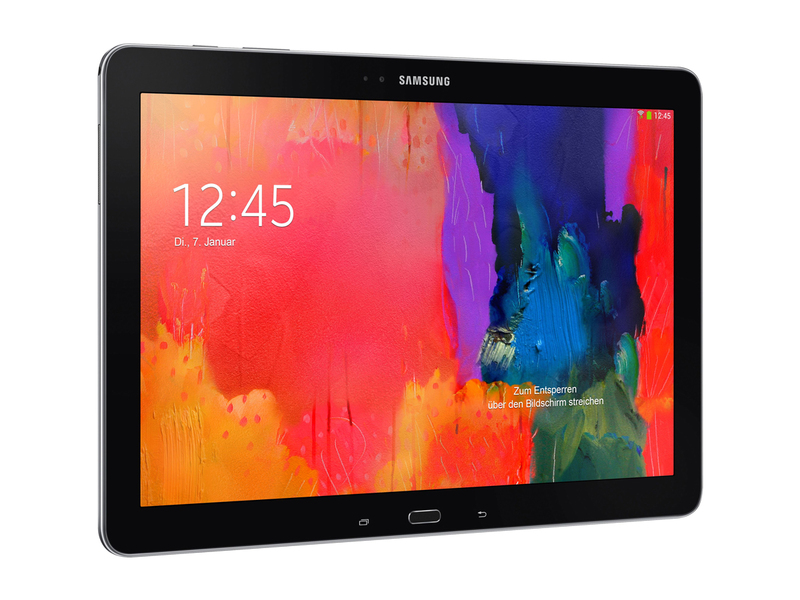 Buyers with the necessary cash get a perfect-to-operate, stylish tablet for professional use. 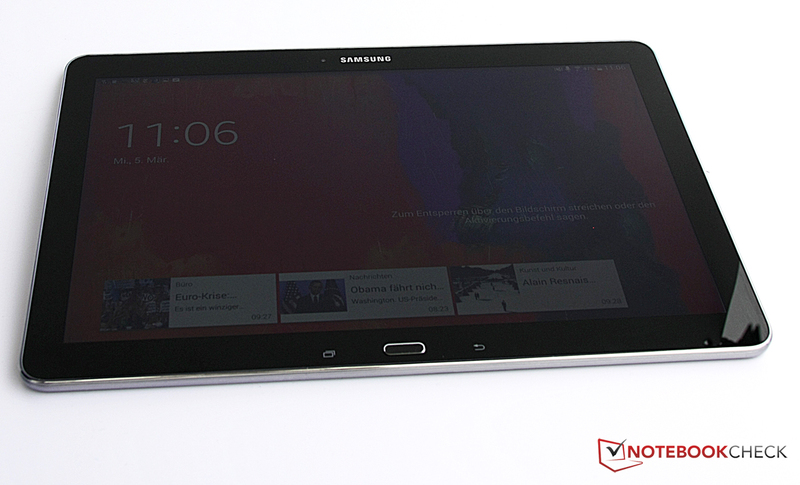 The Samsung Note Pro 12.2 is Samsung's latest hit. The slim outlines are just as appealing as the decent speakers. However, Samsung should take an example from its other models in terms of screen. The rear-facing camera shoots decent pictures. It is supported by auto-focus and an LED flash. The front-facing camera is apt for selfies or video calls, but the quality is middling. The home button is implemented as a hardware button. The all-round, chrome-colored rim is very classy. 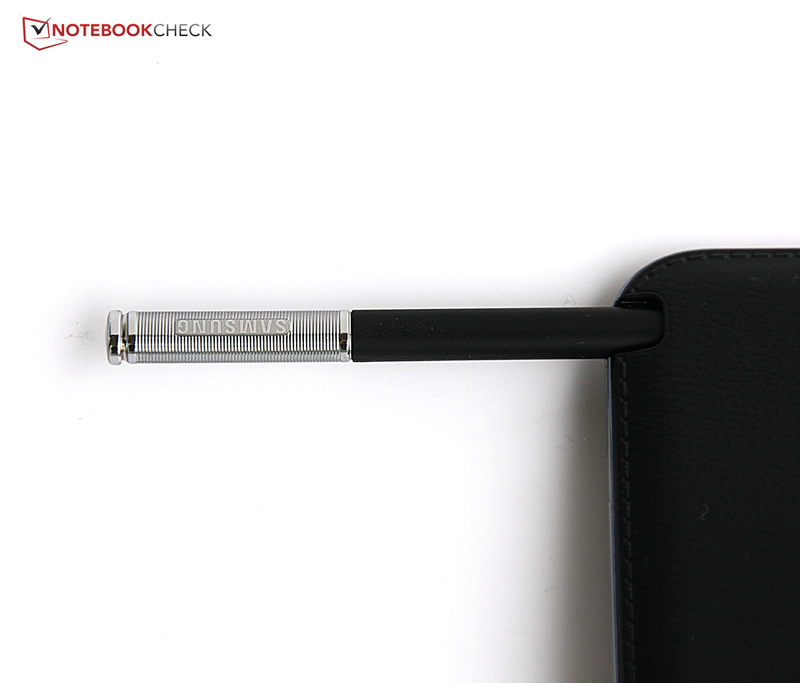 The digitizer pen dubbed "S Pen" facilitates use even more. 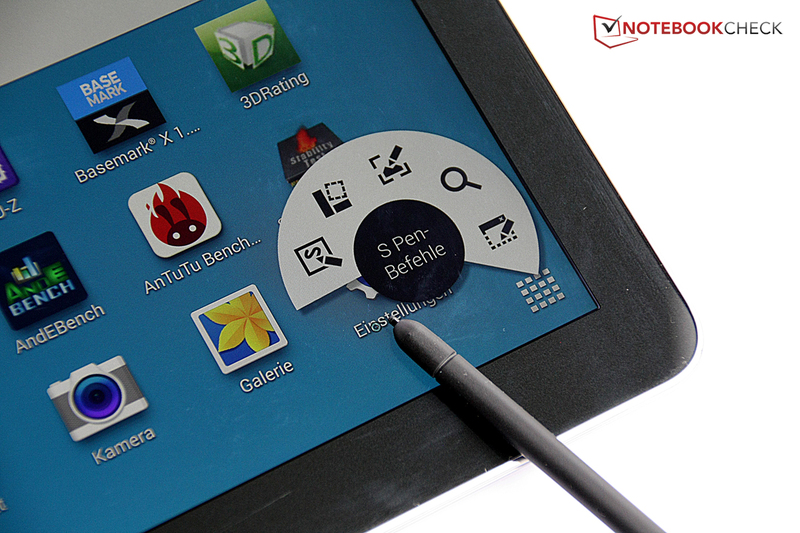 A selection of S Pen commands appear when the pen is held over the tablet, and the stylus button is pressed. Sketching and painting work perfectly with the stylus. The S Pen can also be stowed away securely. Faux-leather covers the back, giving it a very non-slip surface. The volume control and standby buttons are on the upper edge in landscape mode. The USB port is unsual, but likely necessary for quickly recharging the tablet. 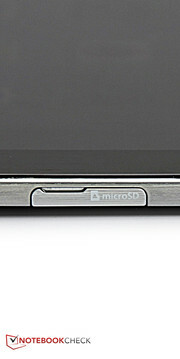 Standard micro-USB plugs can also be inserted. 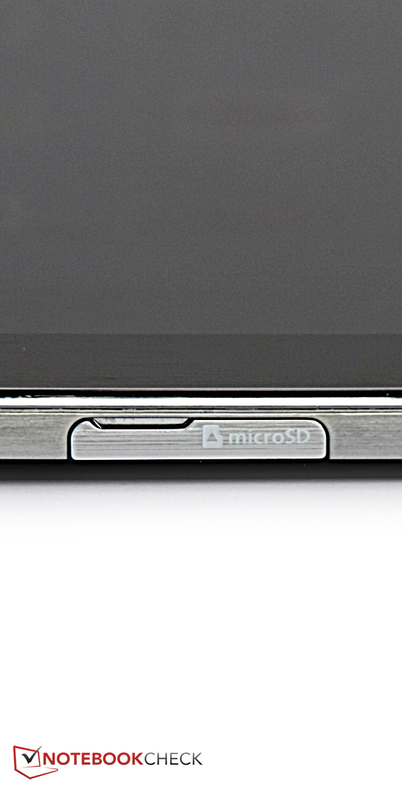 The storage can be expanded up to 64 GB via a micro-SD card. Multitasking is no problem for the strong tablet. 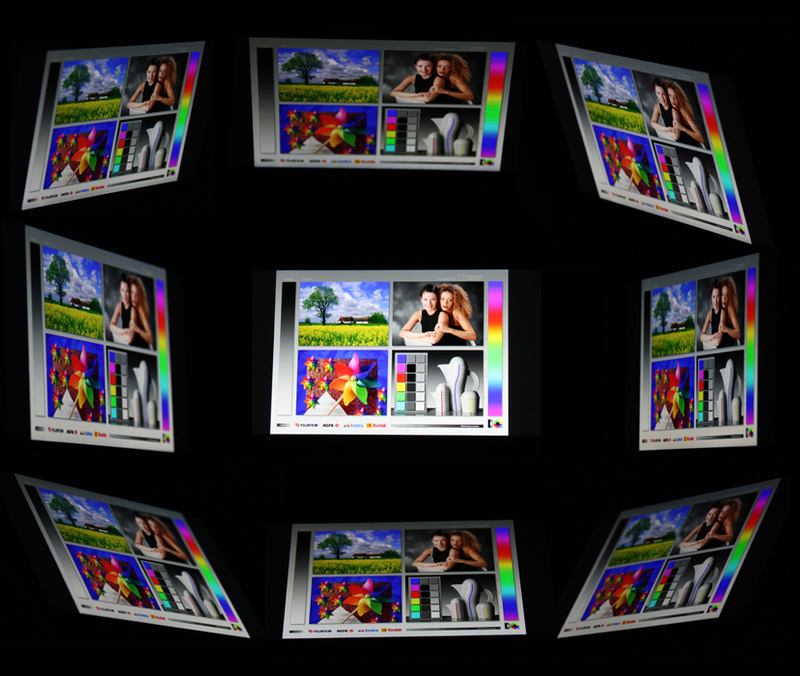 The interface appeals with large images and many customization options. Even fast-paced 3D games are not a problem for the graphics solution. 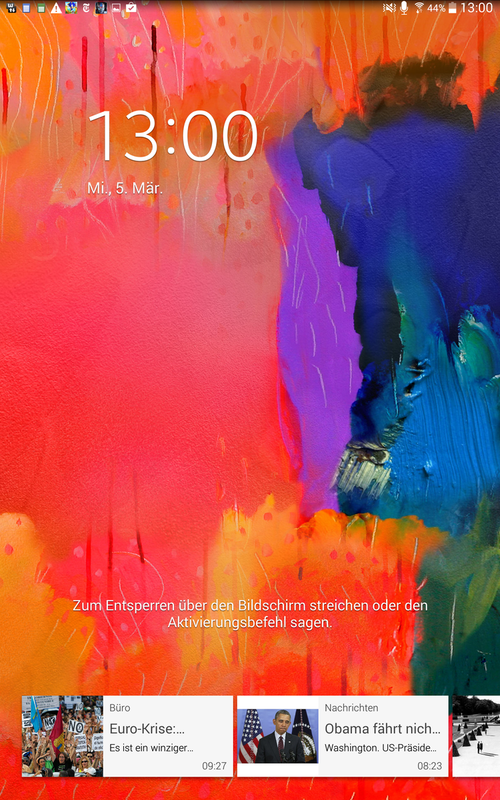 Classy effects, such as watercolors, can be set for unlocking the screen. The main menu has barely been modified but can be largely adapted. The Content Home interface provides all news stylishly and clearly arranged. 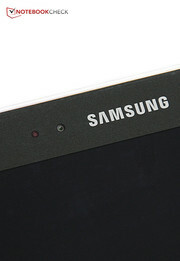 Overall, Samsung launches a very good tablet for professional use on the market. 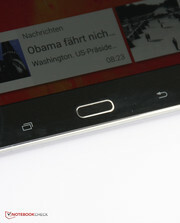 Solid, slim, swift - apart from a few points of criticism, the Galaxy Note Pro 12.2 is a great tablet. Samsung could definitely have copied even more from its other devices for the screen. That stutters in the main menu can occur in a tablet from this price range. Apple iPad Air, Samsung Galaxy Note 10.1, Sony Xperia Tablet Z, Dell Venue 11 Pro, Microsoft Surface 2, Panasonic Toughpad FZ-G1, Toshiba Excite Pro, Fujitsu Stylistic M702, Gigaset QV830.